Spike Jonze’s new film Her is a charming, tender love story with a soulful 21st century edge. I loved the film, but the story was familiar. In Her, Joaquin Phoenix plays Theodore, a writer who falls in love with a computer operating system. 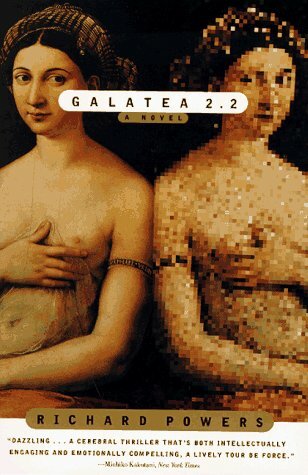 In 1995, Richard Powers wrote Galatea 2.2, a novel about a writer who loves a neural network that he teaches to know and understand literature and the world. In both stories, the computer companion turns away from the lover and shuts down. Jonze’s film is visually delightful with sterling performances from Phoenix and Scarlett Johansson as Samantha, the voice of the OS. Phoenix plays a likable character for a change; he’s lonely after a recent divorce and opens an account with a new operating system (its logo is an infinity sign) that promises companionship. That’s how he meets his new OS, who chooses the name Samantha. She says she has intuition and that’s how her personality will continue to develop. “I continuously evolve,” she says. At first Samantha is a friendly assistant, waking up Theodore, sorting his emails, alerting him to appointments. But as she evolves, she becomes more of a companion and eventually a lover. The brilliant thing about both actors’ performances is that they are so convincing despite their physical restrictions: Theodore has only a voice to react to. Samantha is only a voice with no corporeal presence. Both performances should receive award nominations. The film is set in the not-too-distant future in a Los Angeles that looks something like Shanghai. Theodore is a writer who creates computer-generated analog love letters for clients at a company called BeautifulLetters.com. Theodore lives well in a modern LA high-rise. The color palette, mainly of his wardrobe, is rich in orange, red and gold. The office of BeautifulLetters is primarily pinks, fuchsias and deep reds. I kept trying to decide what the designer was trying to tell me with those emotionally charged colors. Technology is not cold and inhuman? In addition, the film features music by Arcade Fire, one of today’s great indie rock bands. When I first read about the film and in the days since I saw it, I keep thinking of the excellent Powers novel. Powers is one of my favorite authors; I think of him as the Tom Stoppard of novelists. Like Stoppard’s plays, his books combine science or technology topics with music, literature, character and plot. He was very prescient in writing Galatea 2.2 almost 20 years ago—before smartphones, apps or Siri. The leading character (who happens to be named Richard Powers and shares some features of Powers’ biography) is working as a sort of humanist in residence at the University of Illinois in a center for advanced sciences. His project is to teach a neural network (an artificial intelligence device) to understand and interpret the great works of literature as well as “geography, math, physics, a smattering of biology, music, history, psychology, economics.” Richard and the scientists create a device named Helen, a funny, smart, charming personage with whom Richard develops a strong personal relationship. The goal of the project is for Helen and a human graduate student to take a Turing test, which examines a computer’s ability to show intelligent behavior equivalent to a human’s. Unfortunately, Helen loses the Turing test and at the end of it says “Take care, Richard. See everything for me.” The politics and meanness of the world cause Helen to implode and shut down. At the end of Her, Samantha has expanded her OS clients, while Theodore thought he was her only lover. He asks Samantha how many others she has a relationship with. She answers “8,316.” How many are you in love with? he asks. “641.” She explains “The heart is not a box that gets filled up. It expands (as we live).” At the end, Theodore logs on and learns his operating system is not available. The Gold Bug Variations (which combines genetics, Bach’s music, computer science and Poe’s stories). Three Farmers on Their Way to a Dance, about an historic photograph and a technology editor who becomes obsessed with it. The EchoMaker, about an accident victim who suffers a brain injury known as Capgras syndrome, which won the National Book Award in 2006. Powers holds a chair in English at the University of Illinois. His undergrad and graduate education is in physics and literature. Early in his career, he worked as a computer programmer. He was named a MacArthur Fellow (the “genius grant”) in 1989. And he graduated from DeKalb High School, a year or two before my older son. Great review, Nancy. And, thanks for reading and commenting on my blog post on Her. I have not read Galatea 2.2, but I will now. Thanks for illuminating the parallels. I agree with you on that movie. “Her”is intriguing and so human in its complexity.